If there’s one thing we are certain about us and that we love our RC Cars. You know what else never goes out of style? Scaring people with creepy crawly spiders. So if you’re looking for the perfect gift for your little one, why not think about picking them up a remote control spider? For starters, its hard to think of a more impressive parent to give to your children than an RC spider. That is a gift that will never go out of style, and bring endless hours of play with it. However, you may be interested to know that these remote controlled little spider bots are just as educational as they are fun. Radio control or infrared devices are far more than just cool toys. They help bring out the creativity in children by stimulating their imagination. They help form the building block in their mind for scientific thinking, and will motivate them to think about engineering, robotics and science later in life. They also provide hands on learning for your child, and by learning to operate their spider toy, they will start engaging their problems solving skills. Some also come as kits, so your child will have to build it first. It is a fun investment in their development. All this on top of the fact that nothing else out there is going to get more laughs and giggles than one of these radio controlled monster; your little rascal is going to have an awesome time terrorizing the household with their new RC tarantula. If spiders are a bit too creepy for you, why not try a car or plane? Buying a remote controlled spider for your child is not as simple as it might appear, as there’s a lot of variety in what’s on the market and a lot of pros and cons to weigh up. Age range: First things, first, make sure you pick a product in the appropriate age range for your child; some of these spiders might be a little complicated to control or require some assembly, and so you’ll want something your child is able to play with safely. Please note that most of these are no suitable for children under 3 years old. Kits: Some might be ready to go straight out the box, while others come in the form of a kit that will need to be put together. If you are buying a kit, check to see if it comes with all the tools you’ll need in order to make it. Also, remember to factor in some time to help your child with assembly; building it together will be a very fun and rewarding experience for you both. Infrared or Radio Controls: While both are wireless, infrared and radio controls are quite different. Radio controls use radio frequencies to communicate with the robot, while Infrared uses infrared technology and has a much shorter range. While it might not matter that much to you, radio controlled toys might be better for older kids and are much better if the toy is going to be used outside. So you’ve decided to go ahead and get a remote control spider for your kid. Or maybe you just want something to spice up your Halloween party? Either way, there are a surprising amount of mechanical spider toys on the market, with some well known products like the Hexbug and Arakno and also some other lesser-known but very good spiders. No one wants to be in the situation where your child is crushed by disappointment because their favorite new toy turned out to be a piece of junk, so has made a list of the best spiders available in order to help you out. The Hexbug Spider is one of the top choices for a spider bot and has a lot of very good customer reviews on Amazon. 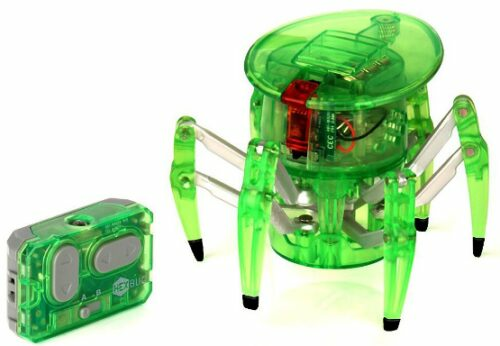 Offering full 360 degree movement and built with a hard casing, your kids will have an absolute blast playing with this infrared control spider bot as its built-in robotic intelligence will see it negotiate all manner of surfaces. They will look on in wonder as the see-through shell shows all the complex mechanisms at work as it moves. It also comes in a few different colors. Best of all, though, the remote can be used to power multiple Hexbug spiders at once. Imagine how much fun your little ones will have with an army of robot spiders at their command! The only con is that it is a little slower than other RC spiders out there, but that might be a pro as it’ll be harder for your child to ambush you with it. This robot kit is literally huge, both in size and the effort it’ll take to get it up and running. This might be one of the best and most educational gifts you can think of for your child. It does require a lot of assembly, and you’ll want to supervise this, but thankfully it comes with all the tools and instructions you’ll need in order to assemble this monster, and building it together will be a challenging yet very rewarding experience to bond over. Once it is built up, though, your little scientist will marvel at the wonders the MeccaSpider can over. Not only does it have infrared controls, it has built in apps and games that will make it a firm favorite in your house for years to come. What other toys can sense movement and chase it around? Check out this customer video to see what it can do. 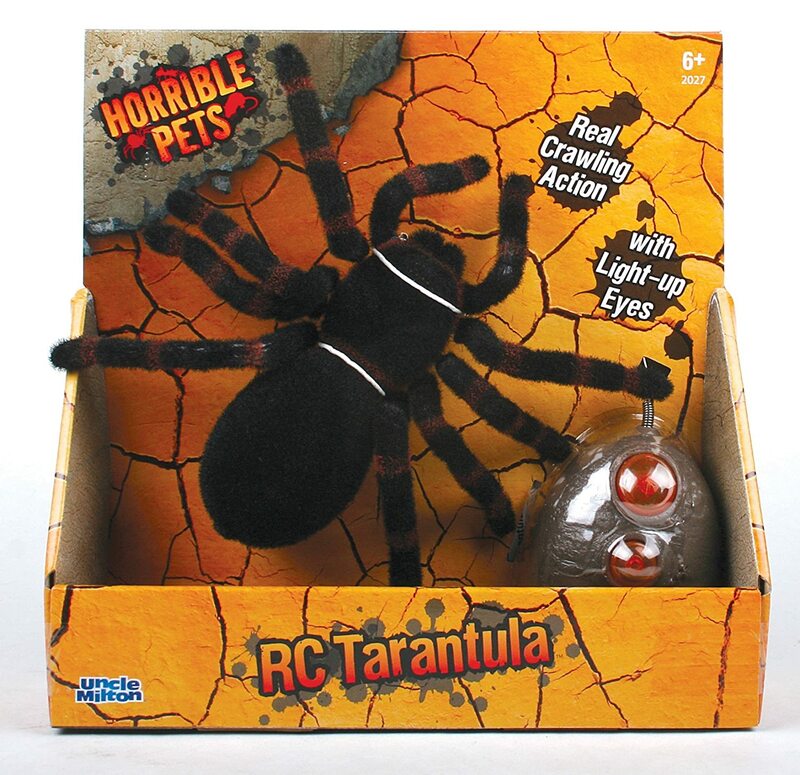 This realistic RC tarantula is the perfect gift for any pranksters out there as it can crawl extremely quietly over any smooth surface and ambush unsuspecting family members. This simple and easy to use toy would be great for a younger child. It isn’t as complex as other spiders on this list, and it is going to have a much harder time crawling over difficult surfaces, but when it comes to fun factor and the potential for scares, the Toys For Kids Spider gets two thumbs up from us, and is top choice for spicing up that Halloween party. Another creeper just waiting to scare your family and friends, this furry little beast can crawl in all directions and has realistic spider-like movements. Its egg-shaped controller is very simple to use, and makes it a great gift for both younger and older children. Also, as this one is radio controlled, it has a greater range than the infrared models on the list. Again, the big con here is that it can only move over smooth surfaces, but that won’t be a problem if your child only uses it indoors. A step up from the normal HEXBUG spider, these remote control spiders are kitted out for a fight. They also move in 360 degrees and have great robot intelligence in navigating surfaces, but these battle spiders shoot at each other with high tech sensors and react when being hit. after 10 hits, the spider shits down and a lifelike heartbeat will rapidly flash! These spiders are brilliant presents for older kids who want to do more than just move the spider around. The only problem is thatyou need more than one to be able to battle, so we recommend you buy the dual set if you are thinking about the battle spider. 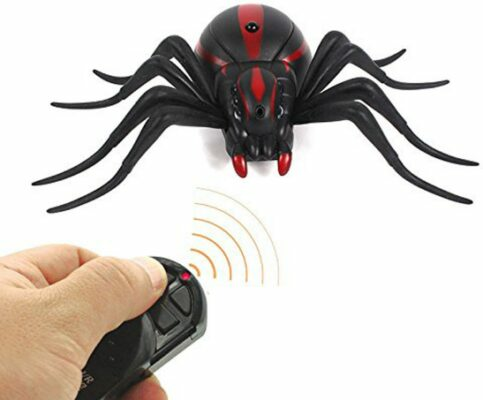 This infrared spider bot was designed to be highly economical and non-toxic, and its realistic design will make it a great gift for and kids who have an interest in creepy things. One thing to be aware of is that it doesn’t actually walk on its legs; it has wheels underneath, so it is more like a spider-shaped RC car, but that shouldn’t stop you from thinking about picking up this fast little RC spider, as it is great for scares and also playing outside. We have to go with Meccano MeccaSpider as our top pick. The hours of enjoyment your kids will get our of this spider bot, from building it to playing with it, is just staggering. Plus, it comes with so many built in games and modes that they won’t grow tired of this RC spider for a long time to come. It does take a lot of effort to get it up and running, but even that is more quality time you can spend with you kids helping them build it. Plus, this will serious ignite the spark of creativity in your child, and could be the first step towards a successful career in robotics or engineering. All in all, this is a win win situation. If you are looking for a spider on a budget, you can’t go wrong with the Toys For Kids model. This cheap and cheerful little crawler will have your kids rolling on the floor with laughter as they use this remote control spider bot to scare friends, family and pets.